The Beat is where you can find Cupid’s latest recommendations and reviews on hot products and services. This week on The Beat, Cupid is featuring a new dating product called FlipMe, a dating aid that gives singles the chance to make a connection they might otherwise miss using personalized dating cards. Rather than relying on online profiles and pictures, FlipMe cards allow you to see if there’s a spark before you make your move. Each card has a special ID code that opens up a secure line of communication between the “flipper” and recipient of the card. 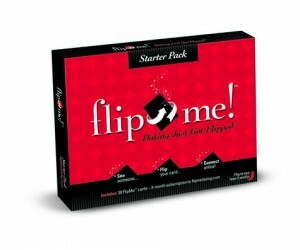 The card also contains FlipMe’s flirt phrase along with directions on how to contact the flipper. If the person you flipped is interested, they can log on to flipmedating.com, and contact you directly at no cost. Cost: 1 package: 30 cards and a three month membership to the website for $24.99. You can also refill your package for $14.99, or buy the Quick Fix (10 cards for $4.99). As a special offer, we’re going to tweet some FlipMe dating cards to our followers. For a chance to win, follow @CupidsPulse, retweet the giveaway, and then email Cupid at cupid@cupidspulse.com saying why you’d want this product. Please include your contact information (and twitter handle) so we can reach out to you if you win. Thank you for reading The Beat! Visit us weekly for new products and offerings.